What type of thin-set mortar should I use when installing ceramic and stone tile over Schluter®-KERDI? Unmodified thin-set mortar is recommended to set ceramic and stone tile, including large format tiles, over the KERDI membrane. Portland cement-based unmodified thin-set mortars are dependent on the presence of moisture for hydration in order to gain strength. Since KERDI is impervious, it does not deprive the mortar of its moisture. This allows the cement to properly hydrate, resulting in a strong, dense bond coat. In fact, after the mortar has reached final set (usually within 24 hours), unmodified thin-set mortars achieve higher strengths when cured in continually moist conditions. With applications of tile on ceilings, it may be necessary to provide temporary support for the tile until the thin-set mortar cures. Exceptions: Certain moisture-sensitive stones, e.g., green marble, or resin-backed tiles may not be appropriate for use in wet areas or may require special setting materials. 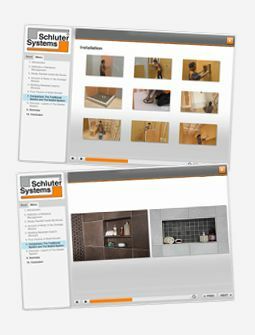 Please consult the stone supplier and Schluter®-Systems for more information. In general, modified thin-set mortar is not recommended to set ceramic and stone tile, including large format tiles, over the KERDI membrane. Modified thin-set mortars must dry for the polymers to coalesce and form a hard film in order to gain strength. When sandwiched between two impervious materials such as KERDI and ceramic tile, including porcelain tile, drying takes place very slowly through the open joints in the tile covering. [According to the Tile Council of North America’s Handbook for Ceramic Tile Installation, this drying period can fluctuate from 14 days to over 60 days, depending on the geographic location, the climatic conditions, and whether the installation is interior or exterior]. Therefore, extended cure times could be required before grouting if using modified thin-set mortars between KERDI and ceramic tile, including porcelain tile. If extended cure times were not observed, the results could be unpredictable. This is even more important to consider in wet areas such as showers as there is the additional concern of latex leaching.